A list of the Top 50 Prog Albums from 1990-2015 featuring Dream Theater, Porcupine Tree, Spock’s Beard, Tool, Opeth and more. All lists of Top Prog albums are dominated by bands from the 70’s like Yes, Genesis, Pink Floyd and King Crimson and rightfully so as those are the originals and and some of the best albums ever made. There has also been incredible music made since those bands stopped making music by a host of newer bands. These “modern Prog” bands are often left off best of lists and not recognized. 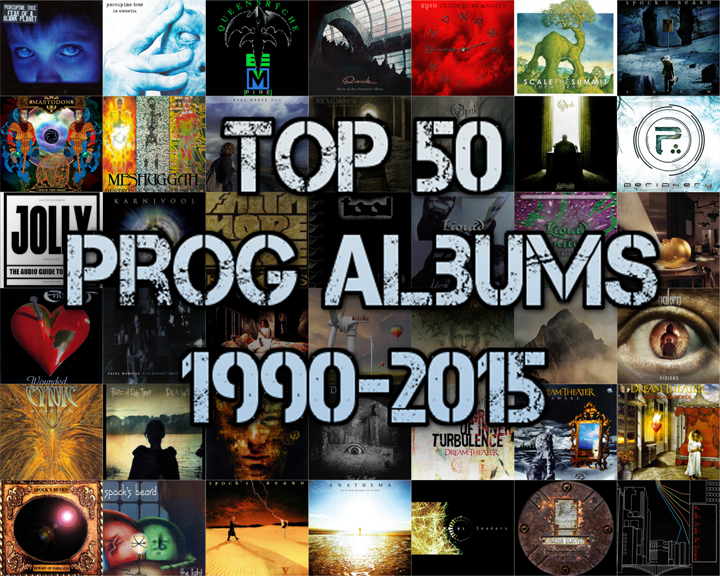 So we decided to make a list of the Top 50 Prog albums of the Modern Prog era, the last 25 years 1990-2015. During that span, bands like Dream Theater, Porcupine Tree, Spock’s Beard, Opeth and others took the groundwork laid by those pioneering bands of the 70’s and infused heavier guitars, modern instrumentation, and even longer songs. It was also an era with more Supergroups such as Transatlantic, Flying Colors and Liquid Tension Experiment. The unifying force in all those bands…Mike Portnoy, who appears an astonishing 13 times on this list between his work with those bands, Neal Morse and Dream Theater. While this list is certain to generate some disagreements and discussion, it was meant more as a chance to recognize the great bands that have been carrying the torch of Prog over the last 25 years. These are all great albums. Hopefully the next 25 years are just as great.